The view from the summit of Monch. The Jungfrau is the tall peak to the right. 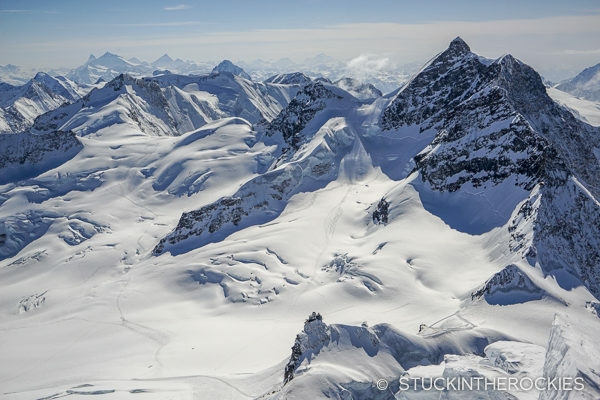 The Jungfraujoch, our starting point, is in the bottom center of the frame. The Sphinxstollen Observatory can be seen perched atop the rocks and the rest of the structure and train station is all inside the mountain. Far out to the left of the frame you can make out the distinct profile of the Matterhorn. We just returned from an incredible adventure through a region of high peaks and glaciers in the Berner Oberland region of the Swiss Alps. 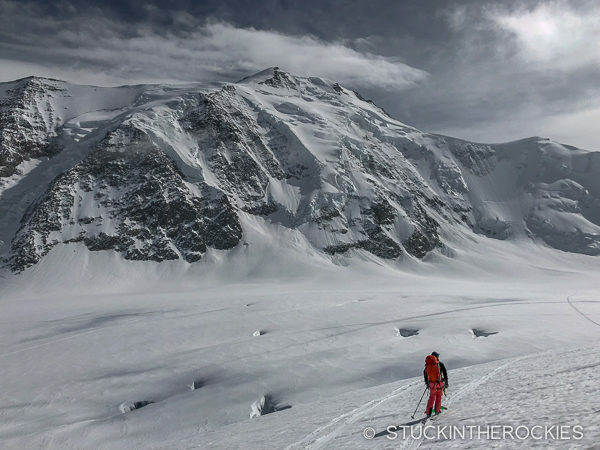 We set out on a five day ski tour that visited four mountain huts in this mountainous region of Central Switzerland. Our trip began in Grindelwald, a classic Swiss mountain village that sits under a famous trio of Alps summits– the Eiger, Monch, and Jungfrau. It was an incredible place to start our trip. The storied north face of the Eiger is something that we had read about for years but never saw with our own eyes. It was really something to finally view the mountain with such a rich climbing and mountaineering history. The Eiger, seen from Grindelwald. To start, we took a train from Grindelwald up to a mountain pass known as Kleine Scheidegg, high above the valley. 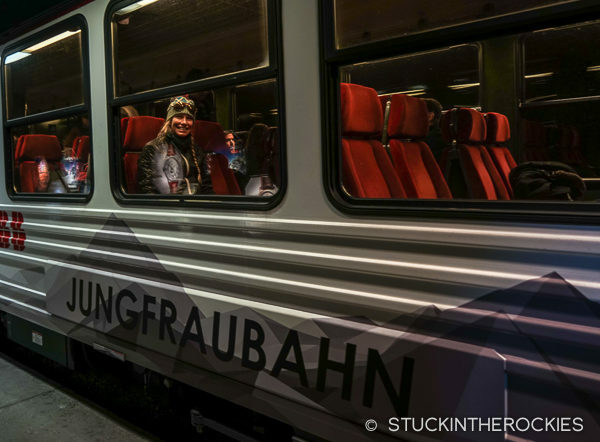 From there we boarded a second train that burrowed up through the mountains to the Jungfraujoch, which at 3,454 meters is the highest railway station in Europe. The tunnel is truly remarkable. 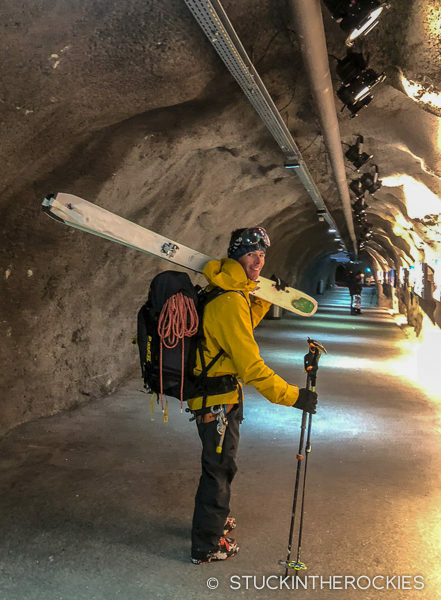 It climbs uphill for about 9 km through the Eiger and Monch to a terminal deep inside the mountain. They carved space for an impressive visitors center, overlook, and every other amenity (Swiss watch shop, chocolate shop, etc.) a visiting tourist might seek. Even more amazing is that they concieved the idea and began work on it back in 1896. 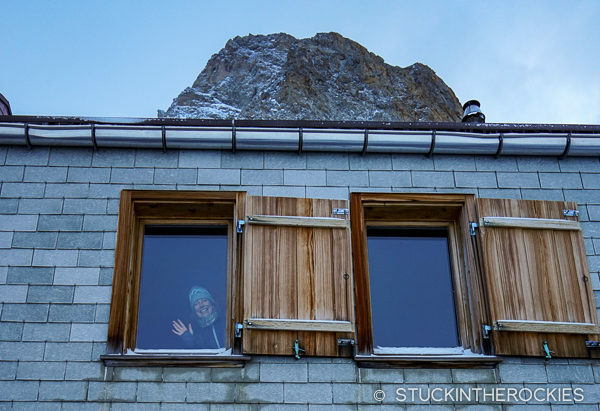 At one of the stops within the mountain, where they let passengers off to catch a view through some overlooks out the side of the Eiger. It’s really a pretty unique thing. As we walked from the subterranean train station to the windows overlooking the mountains and glaciers, much of our five day Berner Oberland route opened up before us. After navigating all the tourists and underground tunnels, we found our way to the snow and got ready to head out. 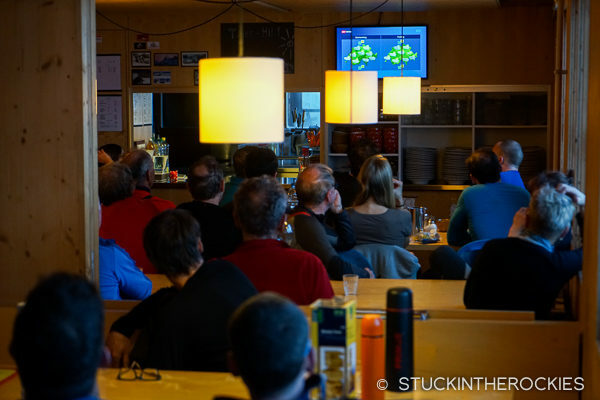 Our first goal was the Monchsjoch Hutte, or Monch Hut as we called it. It’s actually fairly close to the Jungfraujoch, but since it takes a few hours to get up and out of Grindelwald to where we were, the short approach to the hut made for a perfect first day objective. 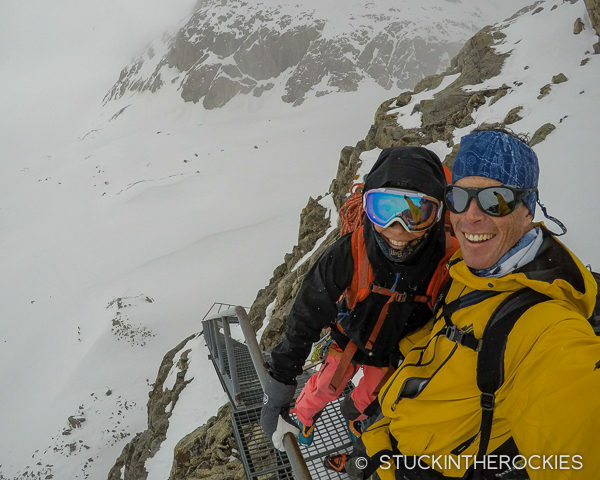 It allowed us to get situated at the hut with enough time to attempt the summit of the Monch that same day. Leaving the comforts of the Jungfraujoch and its concessions, souvenir stands, and day tripping visitors. You can see the tunnel entrance at the base of the rock. 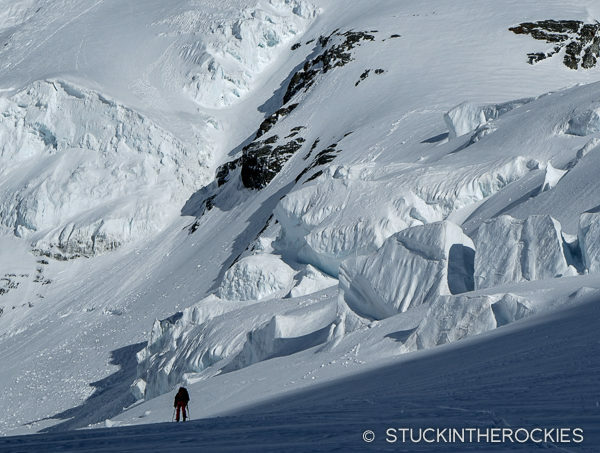 The Monch, 4,107 meters, with its long East Ridge running down to the right. The Monch Hut is at the bottom of that ridge. 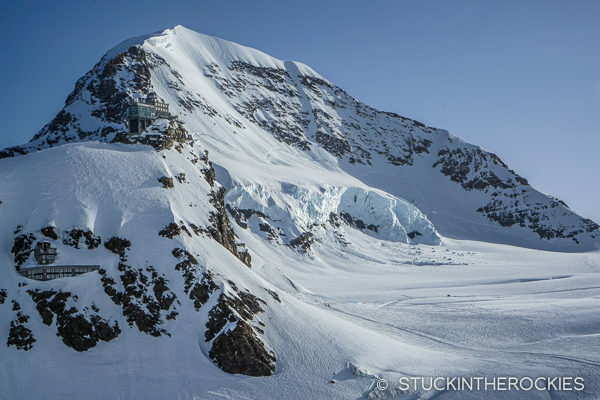 The Jungfraujoch rail station is inside the mountain to the left, the Sphinxstollen Observatory can be seen atop, and some of the windows for the Visitor Center that are visible in its side. The Monch Hut isn’t the most exciting, architecturally speaking. The Swiss are more about function, and between its position on a high pass and its elevation at over 11,000 feet, it’s built to withstand some tough conditions. Unlike the huts we frequent in Colorado, European huts differ in several ways. Generally speaking, they’re much larger, sometimes accommodating more than 100 guests. In many cases they’re staffed and they’ll prepare breakfast and dinner for guests. They sell beer and wine and will do prepared lunches for the trail, they’ll sell postcards, candy bars, T-shirts, and they can often your charge electronic devices. Some of the more modernized ones can have limited running water and fairly nice bathrooms (by hut standards). They’re a different kind of hut experience, and in our case, one that we were seeking. 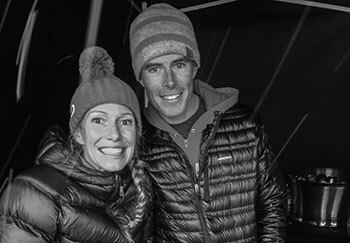 The support they offer meant we didn’t have to carry all of our food and sleeping gear each day, so we could move further and faster. Plus it’s just nice to have a beer at the end of the day and I wasn’t about to haul those around with me all week. 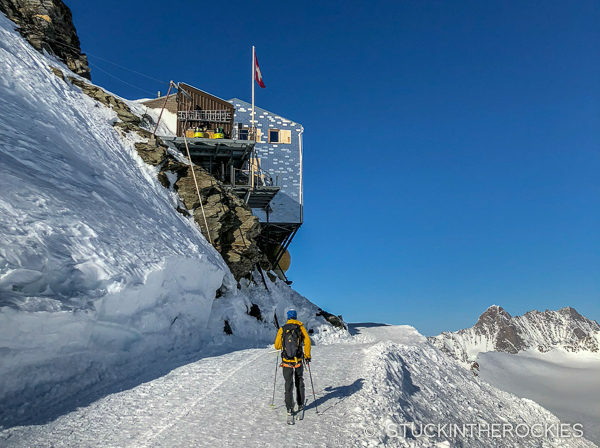 At 3,657 meters the Monch Hut is the highest occupied hut in the country. Upon arrival we left our climbing and ski gear in the gear room (which is a requirement at ALL huts), and we checked in. 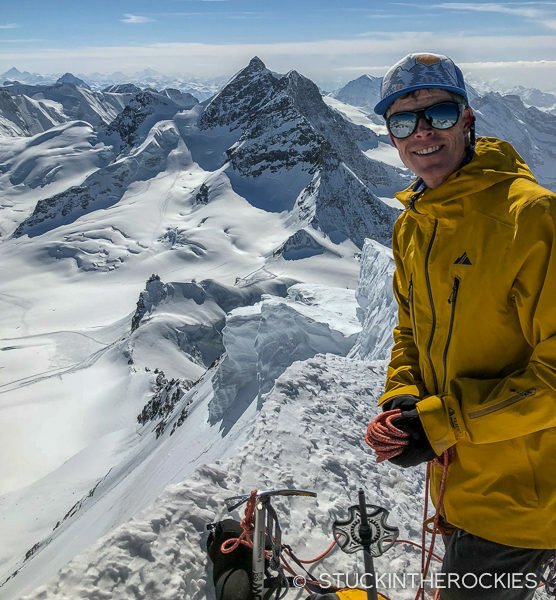 We paid for our night, about 65 Swiss Francs per person which included breakfast and dinner, we left some personal gear at our bunks, and we headed back out to climb the Monch. 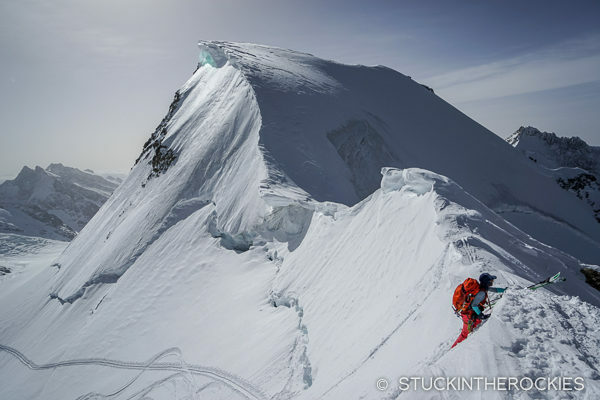 On the East Ridge of the Monch. And just like that we were on our first summit! It was a great introductory day. Since were new to the area and unfamiliar with the snow, we were reluctant to just start charging around on skis. There would be time for that. 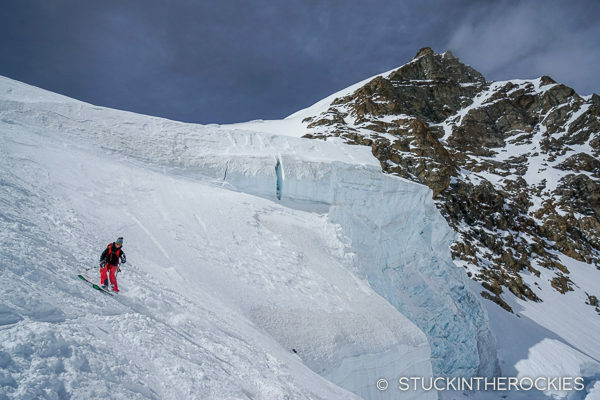 We opted for a climb up and down the Monch on foot, a peak that had been on Christy’s list for many years. It was pretty straightforward, snow and rock, with some airy stretches on the long ridge. It was a beautiful afternoon and there was hardly anyone else around. We reached the summit, thrilled to finally be out on this trip. Once back at the hut we bought a beer and a wine and relaxed while we waited for dinner to be served. The next day we were up with everyone else (about 30 people in the hut) and had breakfast, packed up, and left. 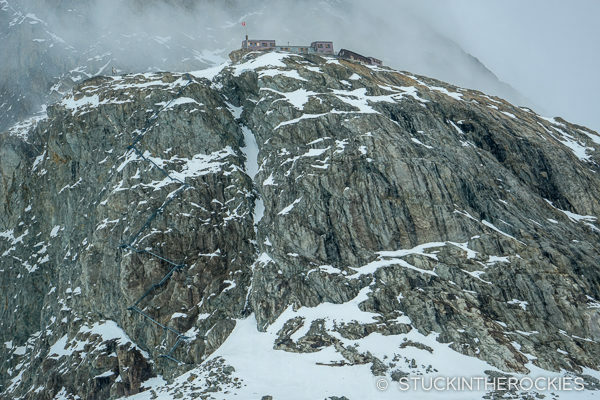 Our primary goal was the Jungfrau, after which we would head to the Hollandia Hut for the night. 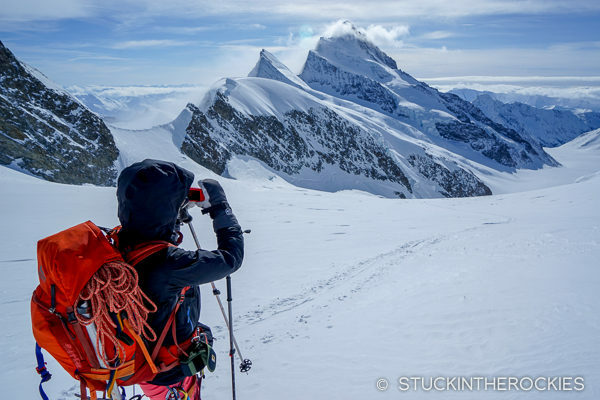 We made our way towards the Jungfrau, and at the base of the climb we left a cache of some extra clothing and gear we didn’t need for the actual climb, and we headed up. The Jungfrau was one of the taller mountains in the area, 4,158 meters (13,641 ft). We followed an old skintrack to a col called the Rottalsattel where we cached our skis and finished the climb on foot. 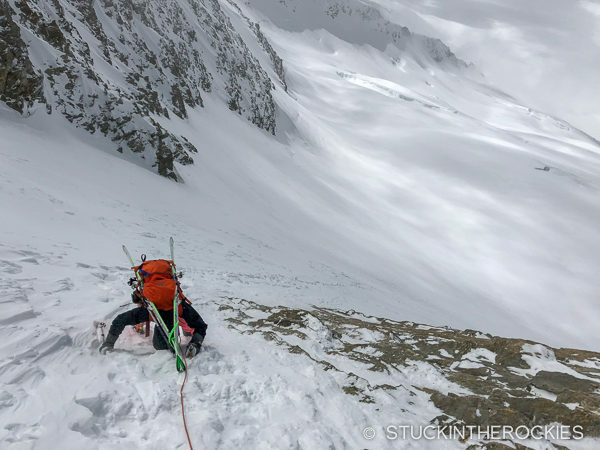 The last pitch of the climb was quite steep and the snow was crusty and icy in parts, and after taking note that other groups weren’t finding it in condition to ski, we agreed. We made quick time to the summit, which once again we had all to ourselves. We headed up the Jungfrau on the beautiful morning that followed. By now the surroundings had become a bit familiar, the Eiger is way out there beyond the Monch. And after a few hundred feet of steep snow we were on the summit! A small plane flew a few laps around us while we were up there, and they were the only others around. I think we were fortunate not to be with others on a nice day like this. Soon enough we were back at the col and getting ready to ski back down, which was some of the best snow we found on the trip. Skiing down from the Rottalsattel. Some of the best snow of the trip! We grabbed our things and headed down and around to the start of a climb up to the Louwihorn. 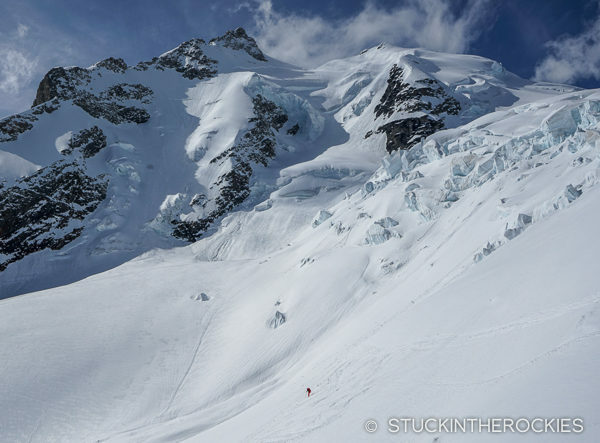 From there we had a really long ski down below the Gletscherhorn which put us on the massive Altesch Glacier. It was almost two hours from that point to the Hollandia Hut. It was a full day, about 9 hours. On a secondary summit called the Louwihorn, en route to the Hollandia Hut. The Gletscherhorn, behind, made for a really cool backdrop on our next ski descent. 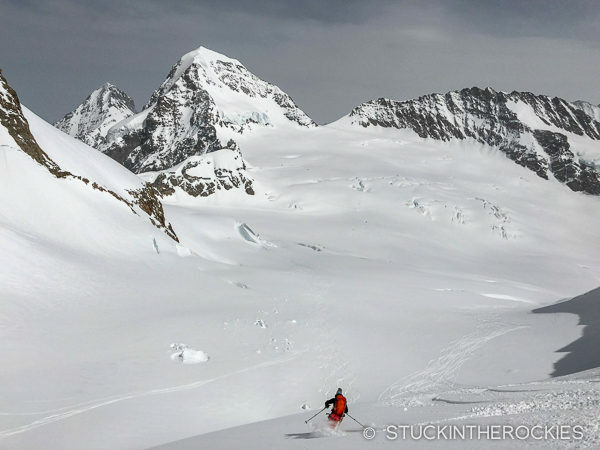 Christy, skiing below the Gletscherhorn and through some broken terrain. It was a long descent down to the Altesch Glacier where we had to skin a good distance to the hut. The 4000+ meter Alteschhorn is in the distance. The weather forecast was calling for changes, it wasn’t going to be as nice as it was the past two days. 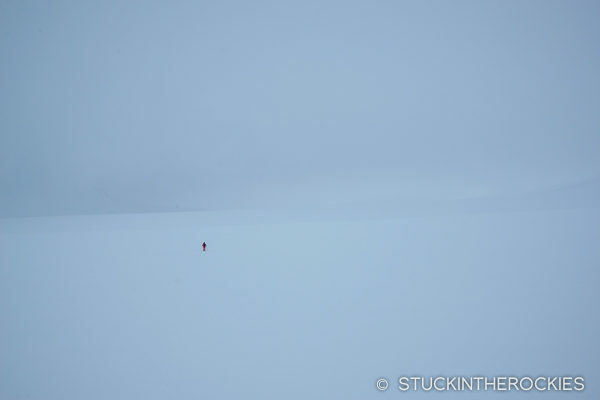 We stared finding ourselves in passing clouds and borderline whiteout conditions. The Hollandia Hut was nice, a bit smaller and much less touristy. We got our assigned bunks, we got out of our ski clothes and headed to the dining room and had a beer. 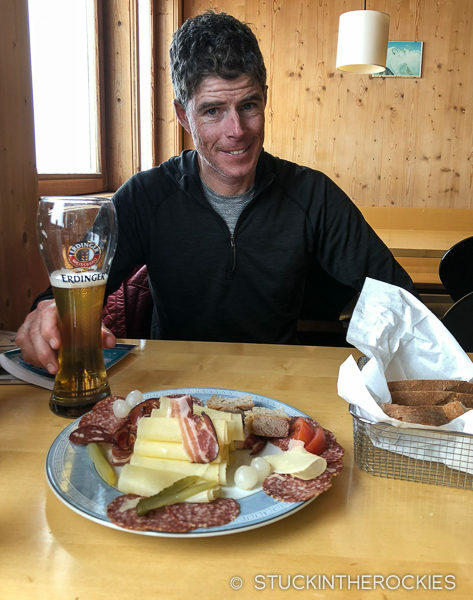 We were assigned to eat at a table with a group of German skiers. Each night at dinner brought some interesting conversations, people were always surprised to learn we were from Colorado. We were often asked why as Americans we would come so far when we had our own mountains so close to home. It was obvious to us of course, this place was really cool. We were having a great time. 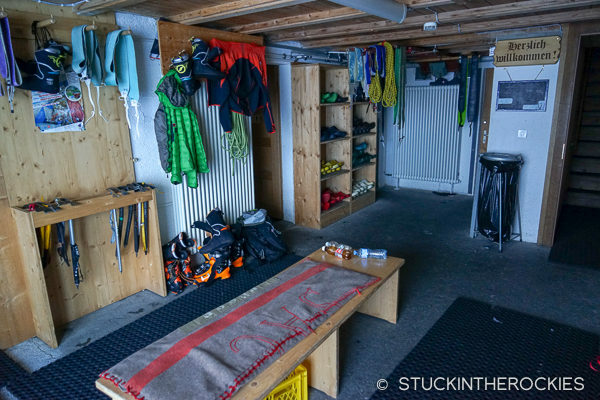 The gear room at Hollandia Hut, a standard entrance feature to all of the huts with room for everyone to sort and dry their gear before entering the main parts of the hut. The dining room at Hollandia Hut. And our two little assigned bunks in a room that slept around twenty people. The following day the weather fell apart. It was forecasted to be that way so it wasn’t a surprise. It was windy and cloudy with some new snow forecasted to fall. 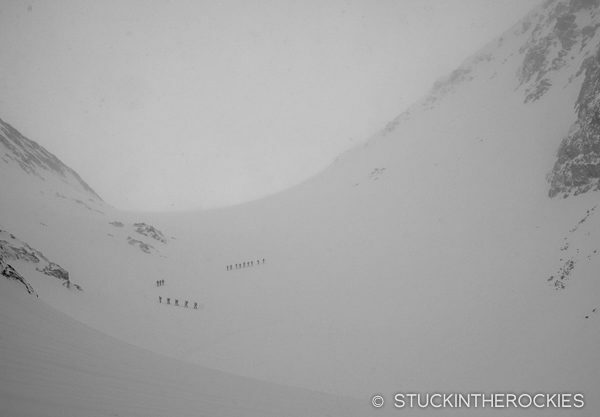 Despite the conditions, many groups headed out to attempt a summit above the hut called Aben Flue. We did the same. Most of them ended up turning back due to bad visibility. 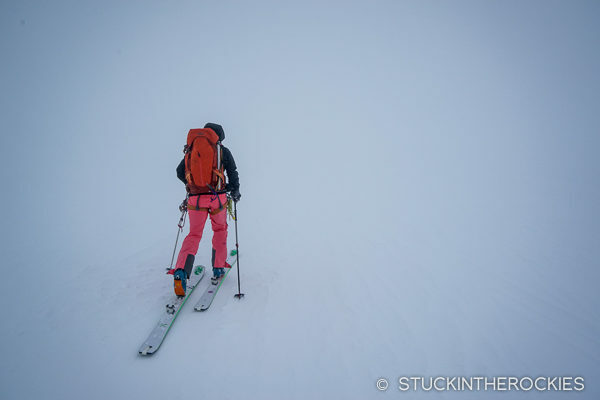 We had everything organized in our GPS so the low visibility wasn’t too much to keep us from moving forward. Leaving the hut (in the distance) to explore the option of skiing Aben Flue. 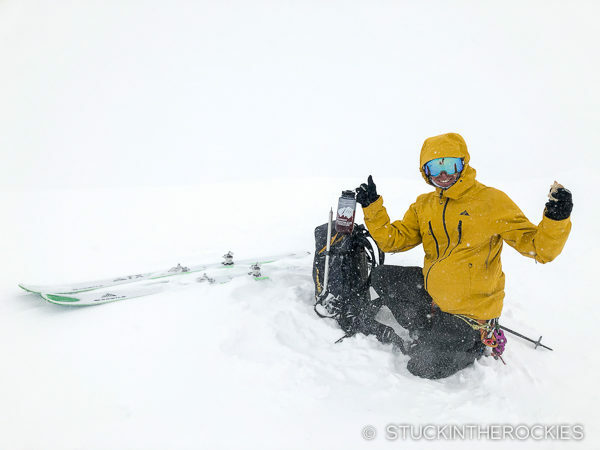 We quickly found ourselves in some whiteout conditions. But every so often we’d get a break in the weather, so we kept going. But when we reached the summit, which could be done entirely on skins, we didn’t have much of a view. 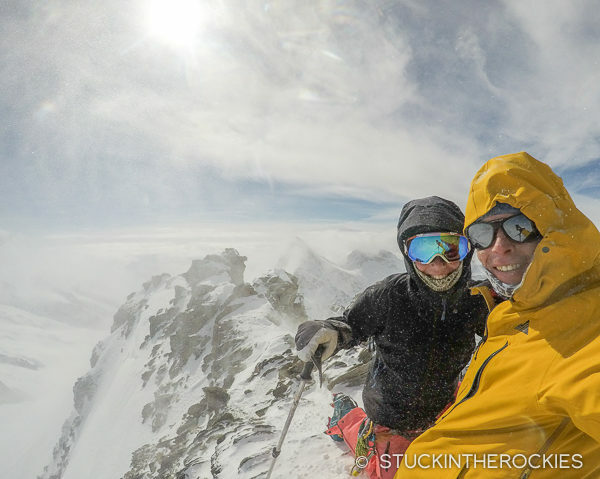 We didn’t have much in the way of summit views, but it didn’t matter. 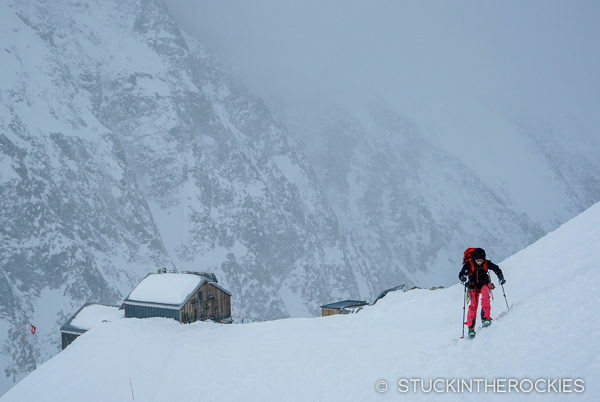 We skied down through the clouds and back to the hut where we grabbed some of our additional gear and headed out and towards Konkordia Hut. 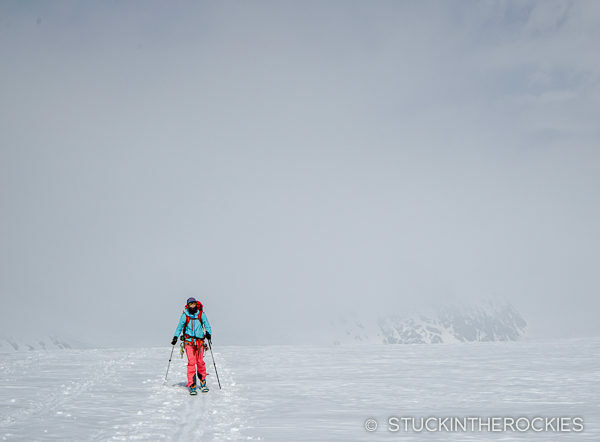 Though it was mostly downhill on the glacier to the hut, a headwind and bad weather/whiteout conditions slowed things down considerably. 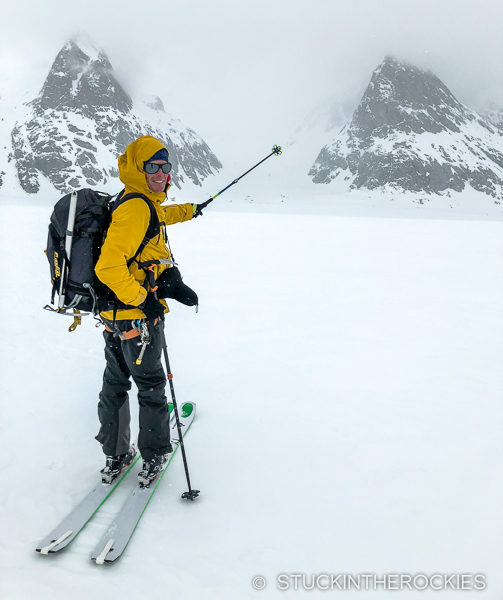 Glacier navigating in whiteout conditions is tough, thankfully there weren’t many crevasse concerns since they had such a big snowpack this year. We were happy to have had the route somewhat preplanned in the GPS. We eventually neared the hut, which we could see high on a rock buttress. 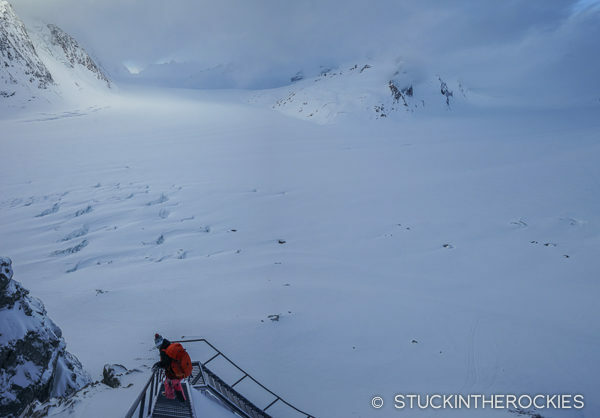 The hut was built in 1877 (though it was a lot smaller back then) and since that time the glacier has receded so much they’ve had to build a series of ladders to assist people in getting from the snow to the front door of the hut. I guess at one point the hut was level with the snow. Now it’s almost 500 feet above it! After a couple hours of whiteout navigating by GPS we reached the big intersection of several glaciers known as Konkordiaplatz. We were told this was the largest glacier in the Alps. The hut was high on the side of the mountain in the distance. As we got closer the ladders came into view (on the left). It was a bit surprising how exposed it felt to climb the ladders. 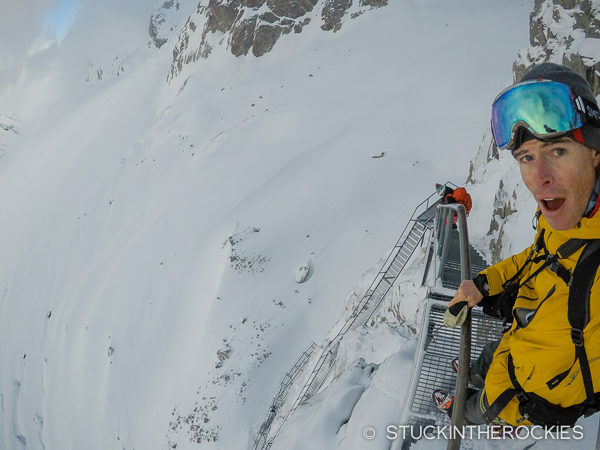 You can see a group of three skiers approaching on the snow below. Konkordia Hut was a cool. It’s a busy, popular hut, and somewhat historic, and the Europeans seem to use it a lot. The bad weather may have scared some people off though, once again there were only about 30 or so guests that night. By now the routine was familiar– check in, go to the bunks, change into comfy clothes, relax with a beer/wine/appetizer and go over the maps and options for the next day, play some backgammon. Follow that up with dinner with new friends (this time it was actually 3 Americans), and head to bed. Repeat. Looking down from our bunkroom as we get ready to embark on the next leg. The forecast called for more mixed weather and some new snow, but not so much that we couldn’t stick to our plan. The Hollandia Hut was way out at the head of the glacier in the photo. Time to tackle the stairs again. It’s recommended to use both hands. Day four brought more bad weather. We realized it wasn’t too bad to rule out getting on our skis though. 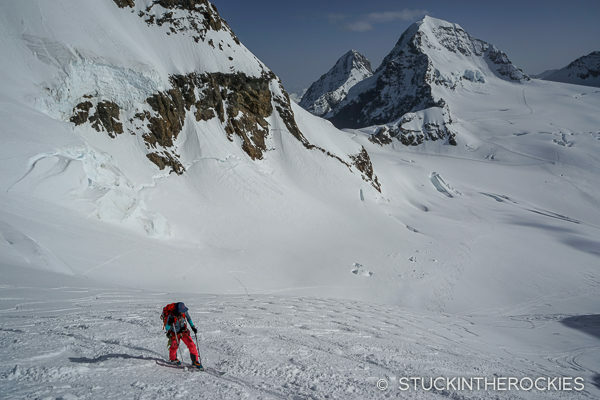 So sticking to our plan, we left the Konkordia Hut and skinned up to the Grunhornlocke and skied down to the glacier in the valley to the east. 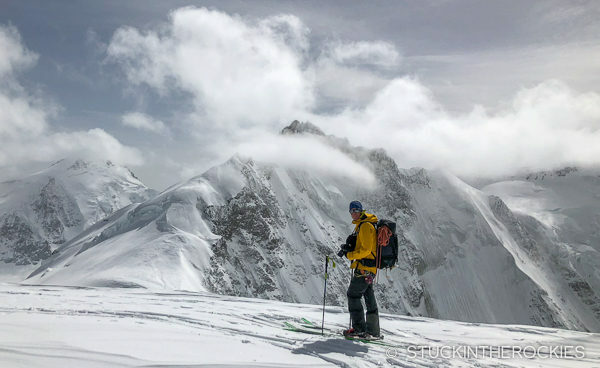 Much like the day before snow and visibility made things tough to see but we still pushed forward on our plan, in this case to climb and ski a nearby peak called Wysnollen. A few other European groups had the same plan, and we all skinned up the moderate snow slope together. 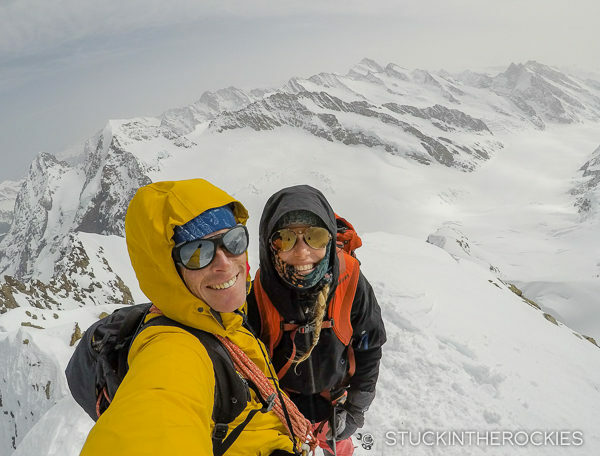 Christy and I tagged another view-less summit and skied back down to the valley floor. We saw the next hut, the Finsteraarhorn Hut across the valley and headed to it. Following a couple of other groups up the the Grunhorn saddle. Europeans love to skin in tight groups. On the summit of the Wysnollen in now-familiar whiteout conditions. 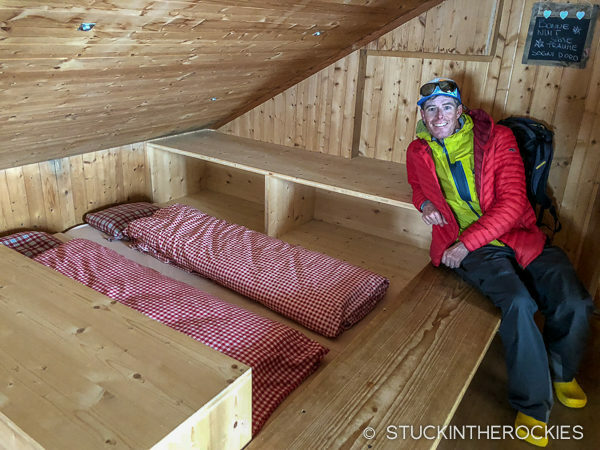 Once at the Finsteraarhorn Hut we checked in and got comfortable. We were bunking and dining with a group of six from France, they were super-friendly and made the whole experience there really nice. Finsteraarhorn Hut was probably our favorite of the four. The rooms are really nice as are the bathrooms, and the dining setup and position of the hut above the glacier is pretty spectacular as well. Out of the weather and in our assigned bunks in dry clothes. We were really getting comfortable with the routine at this point. At dinner they turned on the TV at the moment the German weather forecast was being announced on the news. They did that every night for the same few minutes and then turned it off right away. Unfortunately from the weather forecast we learned the next few days were not supposed to be very good. The best weather we would have was the following morning. 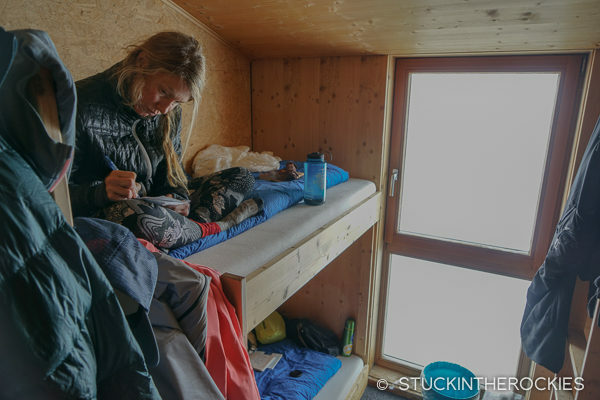 Originally, we had planned to do two nights at this hut and climb the Finsteraarhhorn, 4273 m. But since a lot of snow and wind was forecasted to come in, we thought we should take the opportunity to make our way out while we could, and not risk getting stuck out on the route. The television was turned on for the exact five minutes the nearby weather report came in on the news. This station was German. All dinner conversations ceased and attention turned to the screen. Does anyone speak German? Does anyone know what they said? The next morning we packed up and made our way to the snow with a plan to head home. We aimed to skin up to a high pass that allowed us to descend to a different valley (though semi-technical) that would lead us back to the Jungfraujoch where we started. 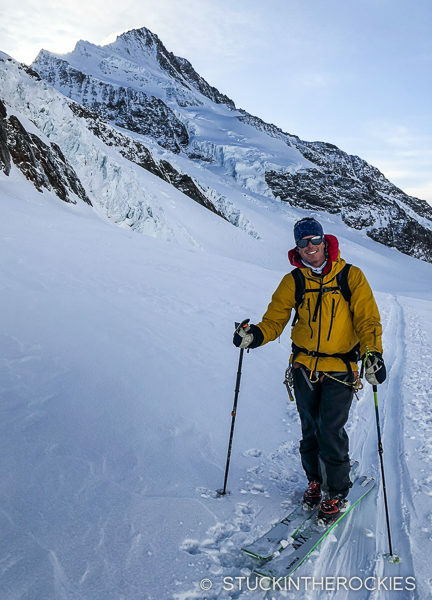 If we were lucky we could possibly summit a 4000 meter peak along the way, too. The skies were clear but the weather was due to arrive in the early afternoon. We hoped we had enough time. Day 5 started as a pretty ideal morning. The Finsteraarhorn, 4273m, was behind. Approaching a broken section of the glacier. Further up, with the 4000+ meter Grunhorn in the distance. So far the weather was holding for us. 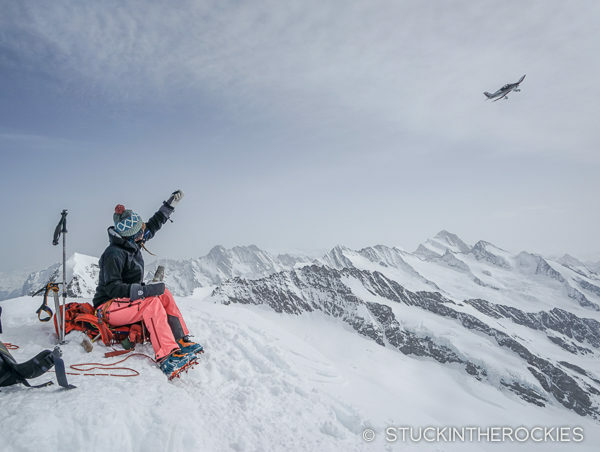 Taking it all in and shooting a photo of Finsteraarhorn, the tallest mountain in the Berner Oberland region. 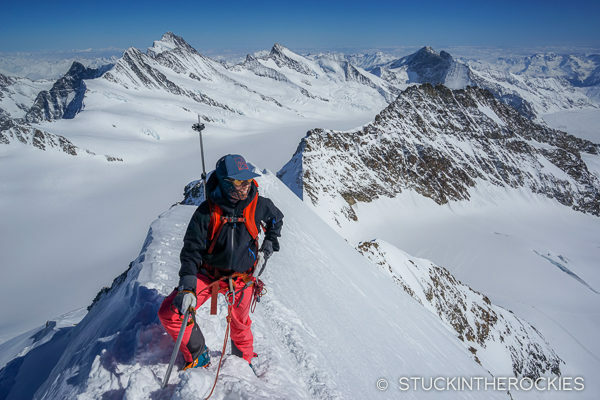 There were others at the hut with the same summit in mind, so we all made our way up the glacier and through an icefall towards the peak called the Hinter Feischerhorn. As we neared it, the winds stared picking up and it was surprisingly cold. Along with various others groups from several European countries, we managed to climb to the Fiescherhorn’s summit and get back to our skis. It was obvious by then that the weather was changing. On the summit of the Hinter Fiescherhorn in cold and windy conditions. Christy and I opted against attempting a second nearby summit and instead began our exit. 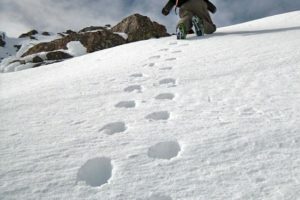 It first involved a roped descent from the saddle which was followed by some navigating of a broken glacier. 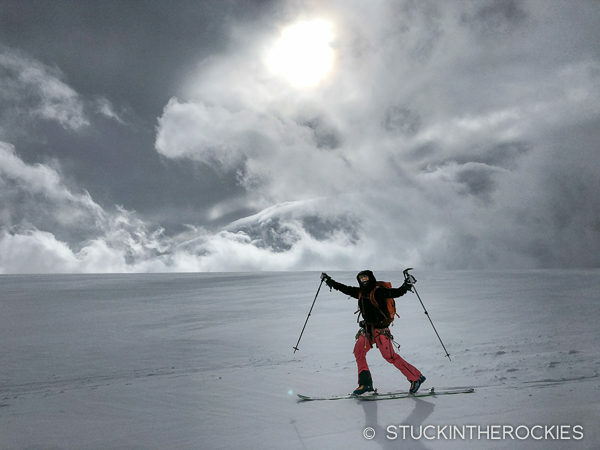 Waves of clouds moved through as we skied though, lowering the visibility and slowing things down considerably. 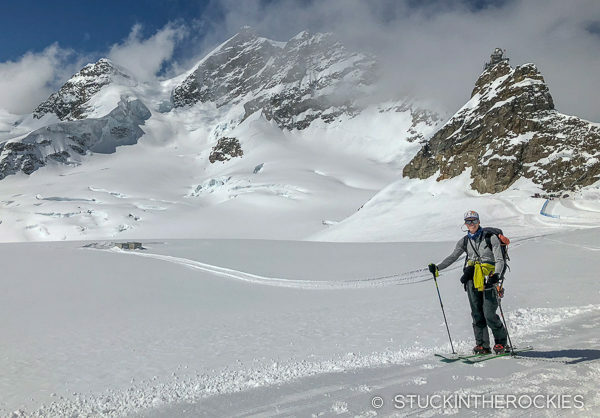 After some time poking around, we found ourselves down on the main glacier with a two hour slog back up towards the Monch Hut and the Jungfraujoch where we started. Descending the Feischerhorn saddle. 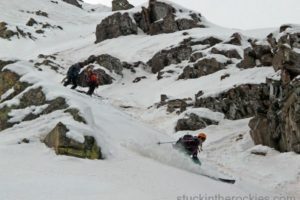 It was a mixed of rock and snow and also quite steep so we opted to downclimb through it to a place where we could ski. And soon enough the nice day transitioned back into whiteout. We slogged up the glacier towards the Monch saddle. 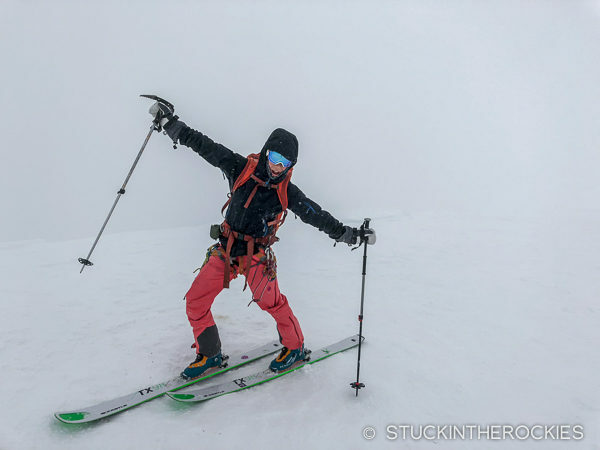 For the 3rd time in five days we were navigating in a whiteout, now heading up the glacier on tired legs and ready to have our 30+ lb. packs off our backs. 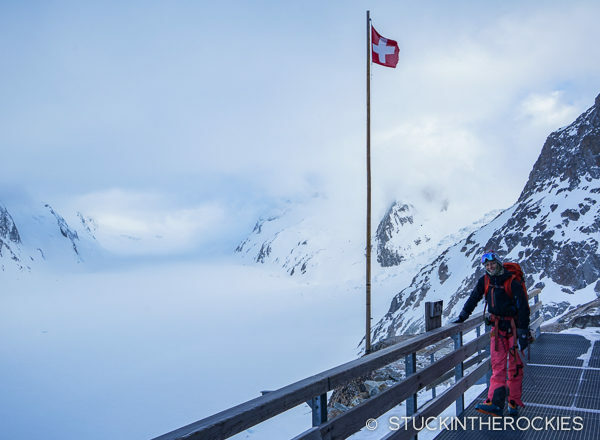 By the time we reached the col at the Monch Hut we were in a full blizzard, but by then we knew the way home. We reached a small door at the Jungfraujoch which let us back in the tunnels and ultimately to the train. 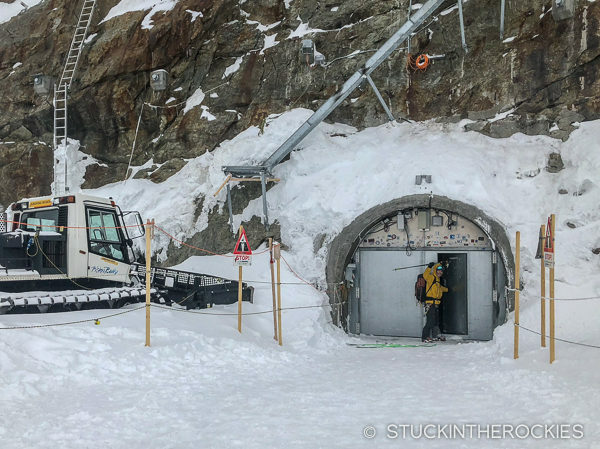 As we approached the reinforced door of the Jungfraujoch we were actually worried it might be locked. The whole place looked shut down. Thankfully we were wrong. Once out of the weather, we headed back to the train station. 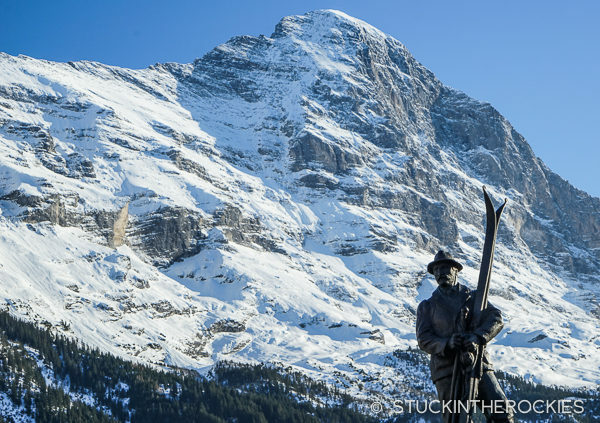 We took it down to Kliene Scheideigg and then we skied the Grindelwald ski area back down to the town. And our loop on the Berner Oberland Traverse was done. What a trip. Use the map below to see each day and the summits and huts, etc. Despite some bad weather on a few of the days we were able to stick to our plan and complete the loop, and even tag a summit each day. In better conditions we could have stayed out there longer and maybe climbed a few more peaks, but this way we have a reason to go back. The Berner Oberland is an incredible place and worth checking out. There are numerous ways to set it up, our loop is just one itinerary. The details of how you do it isn’t what’s important, if you like huts and traverses and just being in big mountains, you should add this place to your list. After Mount Meeker, we were off to the Sawatch Range to ski Lackawanna Peak. Wow, what a great trip. We visited some of that area when we lived in Germany (as tourists not skiers). Thanks for the memories and the great pictures. It was a wonderful trip. We’re already trying to figure out how to get back there and do the things the weather cut short. Excellent post and thanks for sharing the adventure. cool trip! Thanks for the write-up. 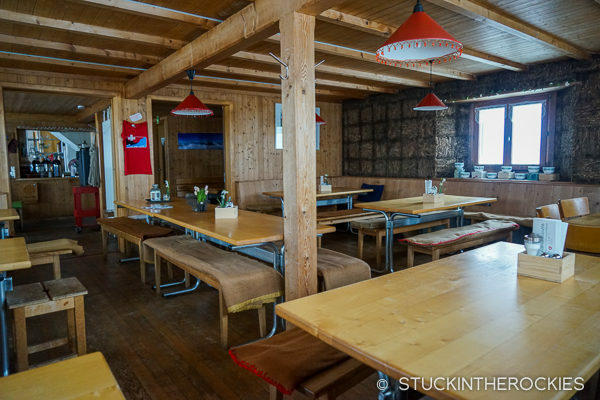 Worth the trip for sure, though there are quite a few similar style and equally “classic” euro hut trips like the Berner all through the Alps. Great photos. Looks like TX98s and F1s (or equivalents)? 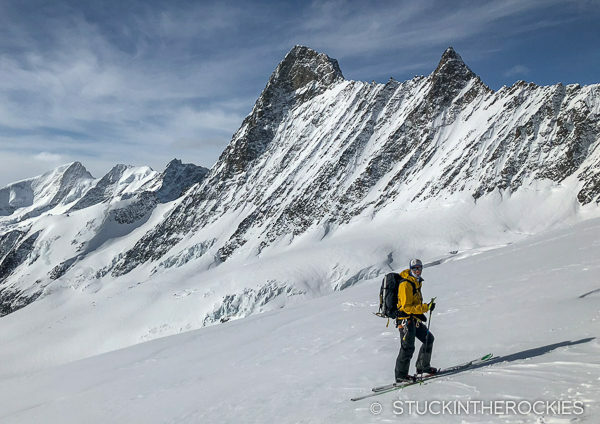 Any reason to go wider or narrower, or heavier or lighter in skis or boots? I actually think I might have preferred a slightly narrower ski (TX90) just because the snow wasn’t so deep or soft to warrant 98mm’s. Since we had quite a bit of weight in our packs I thought the midweight boot was good. I didn’t see any need for anything bigger/heavier. Of course it’s personal. 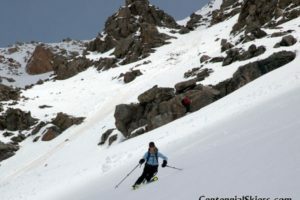 We saw one group out there on skimo race setups which would have been too light to enjoy the skiing in my opinion. But it would work if that’s how you like to travel.